Most debt management plans or negotiated debt settlements aren’t designed to help you get out of debt. They are designed to extract as much money out of you as possible until you are no longer able to pay, and if you happen to get out of debt you will have paid out several times the value of your initial principle in fees, installment payments, and interest. Ten million American families owed more on their mortgages than their homes were worth in 2010. In 2013 nearly half of recent private school graduates were delinquent on their loans, and more than half of all Americans with credit cards could only afford to make minimum payments. In 2014 43 million Americans had unpaid medical bills. 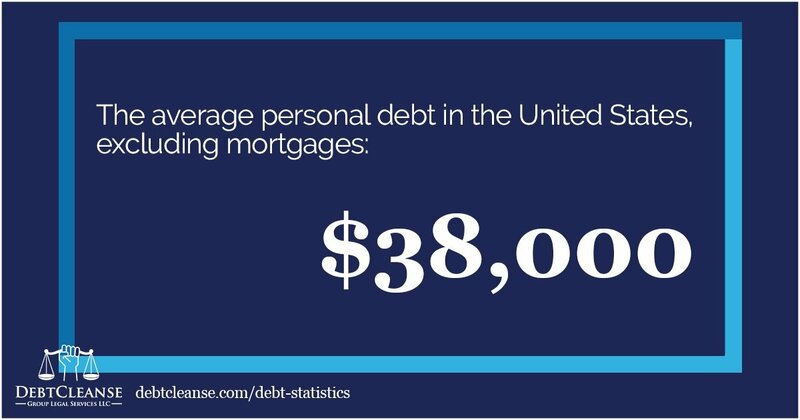 Average personal debt in the U.S. is up to $38,000 even excluding mortgages. Click here to see more shocking statistics on American debt. It’s admirable that so many are committed to doing their best to make payments on their debt—though some are being coerced into payments by overly aggressive debt collectors threatening illegal lawsuits. When mounting debt reaches the point where it is ruining your mental health, having adverse effects on your life, and when it doesn’t seem like there is a way out then you may have reached the point where it’s simply time to stop paying. Don’t keep making minimum payments while interest piles up. Don’t settle for new payment plans that offer lower payments over a longer time, usually resulting in a larger total payment. Don’t sacrifice your own well being and financial future to line the pockets of corporate debt collectors. Break the cycle of endless debt payment. Cutting off payment may seem extreme, but it’s the best way to gain leverage against your creditors, especially if your debt has been sold to a third party. It’s important to note that you shouldn’t just stop payments and then spend that money however you please. You should stop payments, and start setting aside whatever amount you can (in an account not connected to any automated payments or credit cards) in order to pay a negotiated, discounted lump sum at a later date. If you are continue your monthly payments, your creditors have all the power in the relationship and will always extract as much out of you as they can, with little regard for your own quality of life. When you stop paying it strengthens your position, and when the time comes and the creditor (or third party debt collector) is ready to settle you will often be able to negotiate a highly discounted lump-sum payment. Many Americans are trapped in multiple aspects of the debt cycle, for instance being behind on student loan payments, underwater on an auto loan, and in enormous credit debt from trying to pay the minimum on other debts. If you are behind on multiple debts, think about applying these principles to all of your delinquent accounts. Consider not paying all of your debts. Gain leverage on all of your creditors, negotiate discounted payments, and try to clear your slate of debts completely. It becomes clearer and clearer every day that the American financial system is designed to trap ordinary citizens in a cycle of debt. Don’t hesitate to do what you have to in order to break free. Creditors and bill collectors routinely make administrative and procedural errors relating to your debt. DebtCleanse has identified over 130 common mistakes that can mean huge discounts when you negotiate a settlement - including possibly not paying anything at all. Read more about how to turn your creditors' mistakes into debt relief. This strategy isn’t without its own risks. This could have disastrous effects on your credit. However, if you’re far enough down the debt repayment hole this may have happened already. Don’t accept the penalties to your credit score just to stay in a never-ending payment cycle. If you’re already dealing with negative credit consequences, at least have that work toward a light at the end of the tunnel. Also, realize that it is possible to live with bad credit, and it is possible to build that back up over time. In fact, dealing with bad credit after clearing your debts is a far better situation than living with insurmountable debt and a payment structure that is designed to keep you barely afloat, siphoning money away from you slowly for eternity, all the while still facing penalties to your credit score. The average lifespan is 78 years in America. Someone over 43 years old making minimum payments on $5,000 of credit card debt (at a 19% APR, which is average for rewards cards) will not pay off that debt in their lifetime. You can build a life with bad credit easier than you can with a mountain of debt. Your creditors may try (and succeed) to seize your assets or threaten you with legal action.You can take some steps to protect yourself against these risks before you begin your DebtCleanse process, including moving assets out of your name. Read more on how to set yourself up for success here. Of course there is more to clearing your debt than simply not paying. Click here for a quick glance at how it works. Put simply, do everything you can to take control of the situation. As you stop paying you’ll also want to poke and prod to find as many faults with your creditor’s case as you can. Incorrect or missing forms. Legal infractions. Misleading marketing. "...debt collectors will often accept offers of a third or less of the bill owed," according to Emanuel Rivero, a debt counselor with Money Management International. "The statute of limitations to collect on a debt is five years, but it can still remain on credit reports for up to seven years. That means patients with older debt have better bargaining power to clear up that debt – as long as they have the cash to pay." Click here to download the Quick Start Guide and put yourself on the path to a debt-free life. Your creditors will often resort to illegal measures to either intimidate you into settling or win a judgment against you in court. It’s important to find legal counsel that understands these matters, and that buys into your strategy. Premium DebtCleanse members have access to a network of affordable attorneys that have been empowered with DebtCleanse tactics and are motivated to help. Members will receive a complimentary consultation and document review every month, and will save 25% on additional legal work with network attorneys. Reach out to us for more information on taking control of your payments and clearing your unaffordable debts for pennies on the dollar. Our support experts will be happy to help. Fill out the form below or call 800-500-0908.